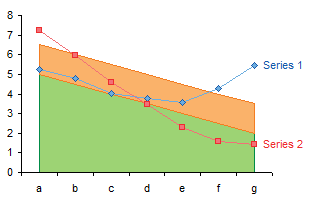 High-low lines are a feature of Excel line charts that connect the high and low points at a given category. For example, in a stock chart the high-low lines connect the high and low value for each date in the chart. A high-low line connects the highest of the values for a given category to the lowest of the values at that same category. All that is needed is two or more series with a point at that category. If there are line series on primary and secondary axes, then you can have high-low lines for the primary axis group of series, and an independent set of high-low lines for the secondary axis group. 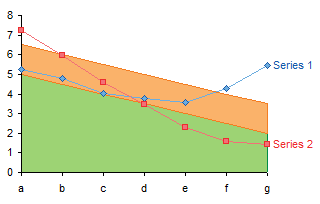 An Excel user emailed me with a question: How can I connect any two points with high-low lines? The user did not provide context for this question, so I’ve invented my own context. Suppose I have two sets of points I want to use for high-low lines, and I want to plot two other series to show how (or whether) they fit within the limits defined by these high-low lines. 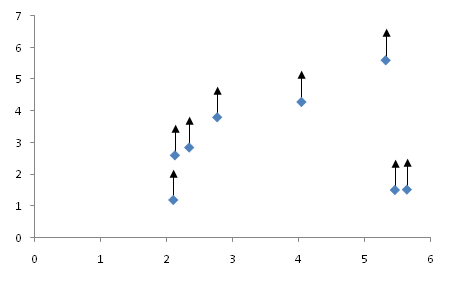 The following data shows data for the two lines to be connected (Connect 1 and 2) and the two series to be compared (Series 1 and 2). When high-low lines are added, they do not automatically connect the two series we want connected. The high-low lines connect the highest and lowest points, just like the name implies. Excel is nothing if not flexible, and there are at least three ways to accomplish the goal of connecting only the Connect 1 and 2 series with high-low lines. 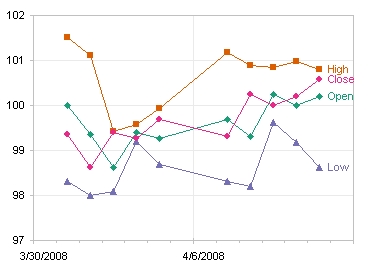 In Excel 2003 and earlier it is easy and straightforward to add high-low lines to a set of line chart series. Double click any of them to open the Format Series dialog. Click on the Options tab, and check the High-Low Lines box. The high-low lines are automatically assigned to all series in the same axis group. In Excel 2007 adding high-low lines is a bit more obscure. Select the series, then go to the Chart Tools > Layout tab. Over towards the right, in the Analysis group, click Lines, then High-low Lines. 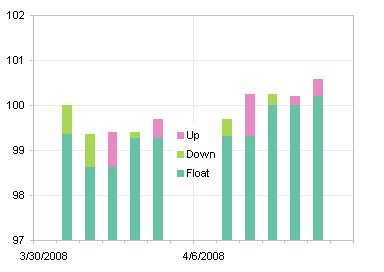 High-low lines can be formatted the same way as any other line elements in a chart. Move Series 1 and Series 2 to the secondary axis. 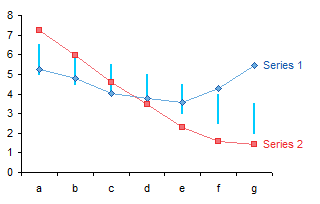 Delete the secondary Y axis (Excel usually doen’t give us a secondary X axis if the chart types are the same). 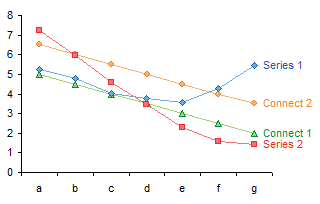 This keeps the series in separate axis groups, but all series use the existing axis scales. Add high-low lines to Connect 1 and 2 on the primary axis. These lines now ignore Series 1 and 2. Format as desired. I’ve used the high-low lines to indicate a range within which Series 1 and 2 values might be expected to lie. High-low lines only connect line chart series, while ignoring XY and other series. We exploit this behavior by changing Series 1 and 2 to XY chart type series. Delete the secondary axis, or better yet, move Series 1 and 2 to the primary axis. Add high-low lines to Connect 1 and 2. 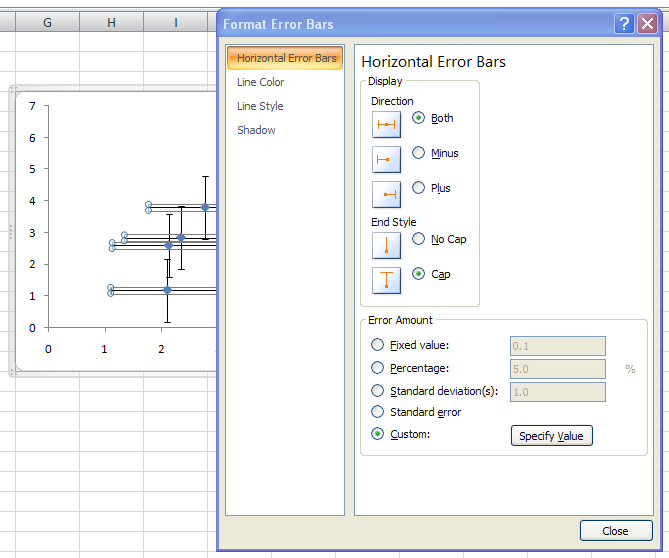 You can use Y error bars to simulate high-low lines. You need to add a column to the data table which has the difference between Connect 2 and Connect 1. This column will be used for custom error bar values. No need to change any series chart types or move series between axes. Just add error bars to Connect 1 using the added Delta column above as positive Y custom values. Hide Connect 1 and 2 (format with no markers and no lines). In fact, Connect 2 doesn’t even need to be in the chart. Error bars can be formatted like any other line element, so format away. I’ve covered error bars in Error Bars in Excel 2007 Charts. It’s straightforward in Excel 2003 and earlier, but remarkably obscure in Excel 2007. Progress, eh? I didn’t just describe the Excel 2007 error bar aggravation in the article above. I built an add-in to make error bars easier to create in 2007. The add-in works in Excel 2007 but also in earlier versions. You can download the add-in from a link near the end of the article. 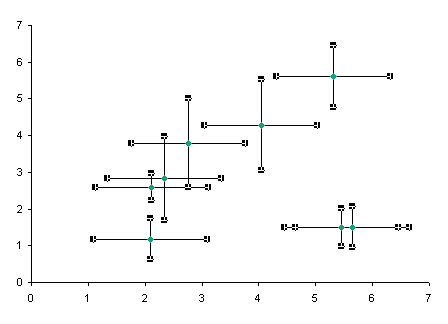 I’m not sure why the user wanted high-low lines to apply to only some series in the chart. Possibly he was adding a data series to a stock chart, some kind of market index, and it was changing the high-low lines for his stock data. I covered this problem in Stock Charts in Excel 2007. If the high-low lines are there to indicate for example an acceptable range for Series 1 and 2, keeping the Connect 1 and 2 lines might help delineate the limits defined by the high-low lines. 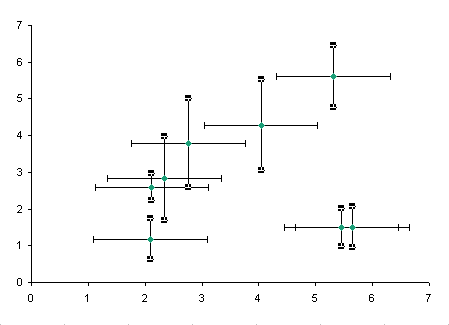 But all these lines are a distracting way to indicate a particular range on a chart. Why not build a shaded region to do this? Change the data for Connect 2 so it uses the Delta column, then convert Connect 1 and 2 into stacked area chart type series. 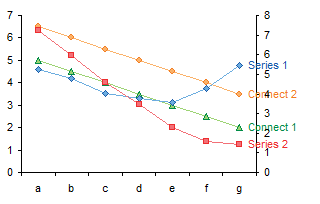 If desired change the X axis so the Y axis crosses “between categories” (2003) or “between tick marks” (2007). Format Connect 1 so it’s invisible (no border, no fill), then remove the border of Connect 2 and use a light shade for its fill. Floating bars or columns in a chart can be a good alternative to High-Low Lines. 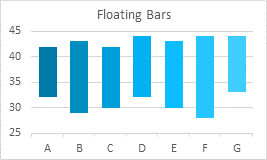 See Floating Bars in Excel Charts for a detailed discussion of all the ways to create floating bars in Excel charts. Posted: Wednesday, March 3rd, 2010 under Formatting. Tags: error bars, High-Low Lines. 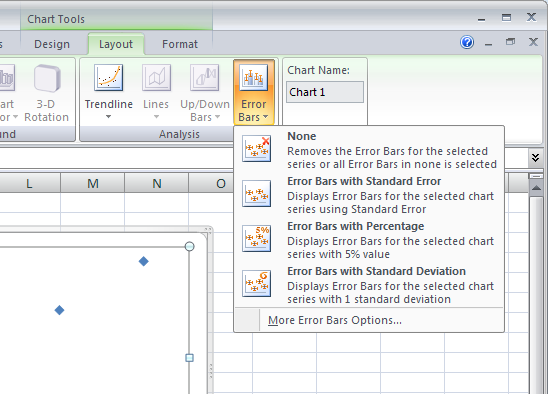 Microsoft has made a number of changes to how you use error bars in Excel 2007. 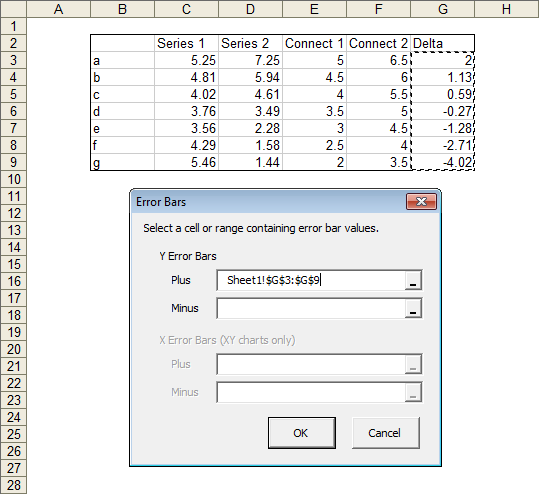 I wrote an article some time ago, which covered how to use Error Bars in Excel Charts, for versions 97 through 2003. Now it’s well past time for an update. Warning: This is a long post. It contains a lot of pictures though to keep you entertained, and near the end there’s a cool utility you can download and use for free. 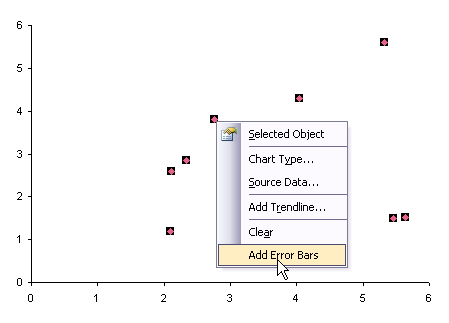 It’s easy to add error bars in Excel 97 through 2003. Bring up the Format Series dialog, by double clicking on the series, by right clicking on the series and choosing Selected Object, by selecting the series and choosing Selected Data Series from the Format menu, or by selecting the series and clicking the shortcut, Ctrl+1 (numeral one). The dialog has a tab for Y Error Bars, and if it’s an XY data series, there is also a tab for X error bars. 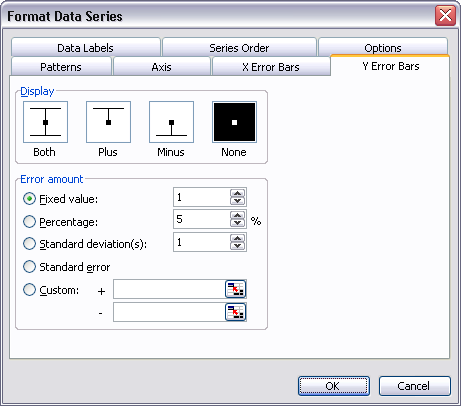 From this dialog you can assign values to the error bars, such as a fixed value, a percentage of the data point value, a couple of statistical measures, and custom values from a worksheet range. You can also assign the direction of the error bars (plus, minus, both, or neither). One nice feature is that the custom error bar value selection controls are right on the same dialog as everything else. To format error bars, you first select them, then bring up the dialog with a double click, a right click, the Ctrl+1 shortcut, or the Format menu. 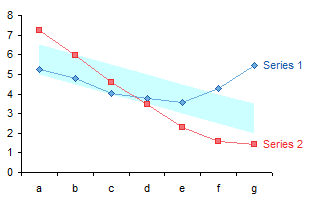 In the chart below I have clicked once, which selects both X and Y error bars in an XY chart. The dialog has three tabs. Any changes you make on the Patterns tab affects both X and Y error bars. The other two tabs allow you to reapply error bar values. 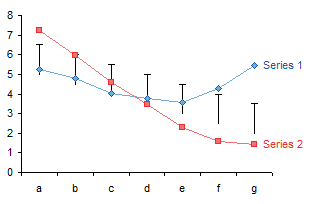 Rather than selecting both sets of error bars in this chart, I have clicked once to select both X and Y error bars, then again to reduce my selection to just the Y error bars. The Format Error Bars dialog now only has a Patterns tab and a Y Error Bars tab. 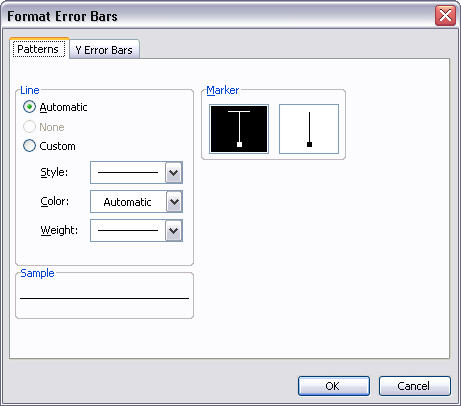 If you change any format on the Patterns tab it only affects the error bars you selected before opening the dialog. It is harder to apply error bars in Excel 2007. There is no convenient tab on the Format Series dialog. The Error Bar tab(s) as well as the tabs for Data Label, Up/Down Bars, High/Low Lines, and other features have been removed to make them more discoverable, at least that’s what we were told. 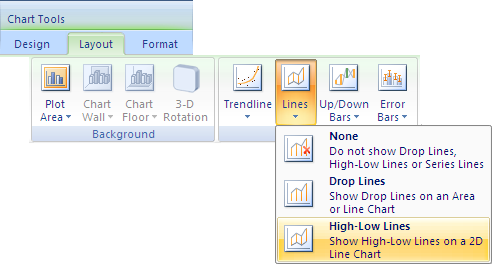 To discover these features in Excel 2007, select the chart and navigate to the Chart Tools > Layout contextual tab. Click on the Error Bars button, and scratch your head while you try to decipher the options. This dialog doesn’t look too unfamiliar. There is no obvious way to switch to the horizontal error bars. We are used to having not just a tab for the vertical error bars, but also one for the horizontal error bars. Hmm, oh yeah, modeless dialog. Click on the horizontal error bars in the chart, problem solved. 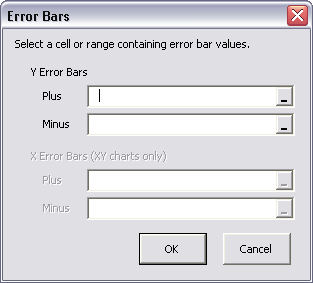 Unlike Excel 2003 and earlier, you cannot select both X and Y error bars in Excel 2007. This means that if you want the same formatting to both, you have to apply it twice, and the F4 function key shortcut for Repeat Last Action only repeats the last single itty bit of formatting (if you change line color, thickness, and dash type in that order, for example, only dash type is repeated). An inconvenient part of the user interface for error bars in Excel 2007 is that you need to click a button to enter custom error bar values, and this pops up a small dialog. This dialog is modal, so if the Format Error Bars dialog was partially covering the range you want to use, you have to clear the small child dialog, move the main dialog, and bring up the Custom Error Bars dialog again. 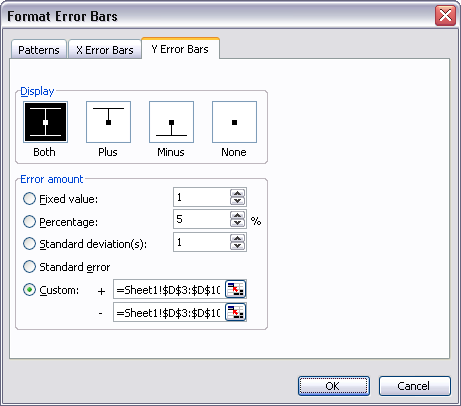 Custom error bars are described in more detail in Custom Error Bars in Excel Charts. If you want the value to be zero, enter zero. Don’t completely clear an entry box. because Excel will think you simply forgot and it will retain the previous value. For all of the problems, using error bars in Excel 2007 isn’t completely terrible. You have some nice formatting options available to you. One that appeals to me is an alternative to the regular end cap appearance of the error bars. You can change to the end-cap-less variation, then format the error bar line style so they end with an arrow head. I don’t remember if this is the most useful, or the only useful, new formatting feature available in Excel 2007 charts. To make it easier to use error bars in Excel 2007 (and in Classic Excel), I’ve built a small utility, which you can download and use for free. It’s found in ErrorBars.zip. This zip file contains two versions, ErrorBars.xls for Excel 97 through 2003, and ErrorBars.xlam for Excel 2007. Install this utility by following the instructions in Installing an Excel Add-In or in Installing an Add-In in Excel 2007. 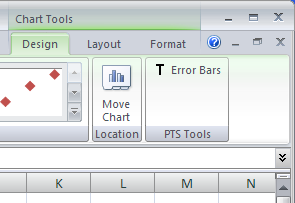 In Classic Excel, the utility places a new item, Add Error Bars, at the bottom of the chart series context menu. All you have to do is right click on the series and select Add Error Bars. Despite all the assurances that context menus work the same in Excel 2007 as in earlier versions, you cannot add an item to an Excel 2007 chart-related context menu. What I’ve done instead is to add an Error Bars item to the end of each of the three Chart Tools contextual ribbon tabs. I know the new philosophy of Office is to place a command in only one place in the whole user interface. I prefer the old style philosophy, however, which is to place the command in every place it may be relevant. I never know where I may be when I want to use a command, and some people remember different hiding places than I do. Whether in Excel 2007 or in earlier versions, click on the added command, and the utility behaves the same. 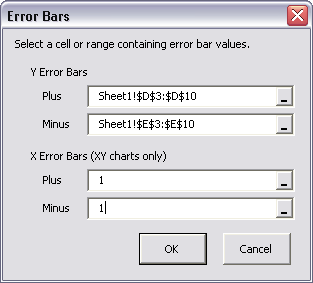 Up pops a simple dialog with four data entry boxes, for plus and minus Y error bars, and for plus and minus X error bars. If the chart type is not XY, the X error bar entry boxes are disabled. You can select a range or enter a constant into the entry boxes. I hope that this tutorial and the associated utility will make your life easier when working with error bars in Excel 2007. Posted: Wednesday, December 10th, 2008 under Excel 2007. 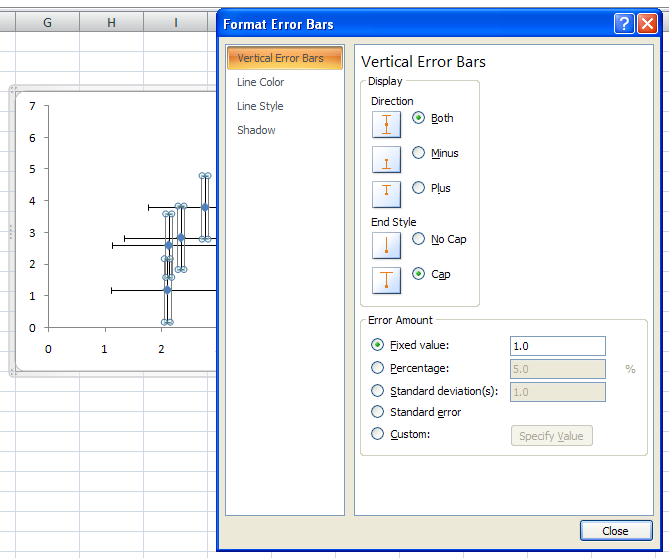 Tags: error bars, Excel 2007, Utilities. A candlestick chart is used to show stock price performance, typically daily; a bar shows the daily change from the opening to closing price, with different colors for gaining and losing changes, and lines extend from the bar to the daily high and low. 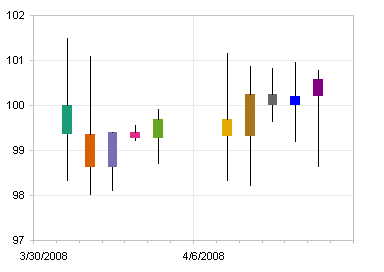 I was recently asked how to apply different arbitrary colors to individual up-down bars in a candlestick chart. As I showed in Stock Charts and Other Line Chart Tricks, a candlestick chart can easily be fashioned from a run-of-the-mill line chart in Excel. (The web page just cited and this blog post were written about Excel 2003. 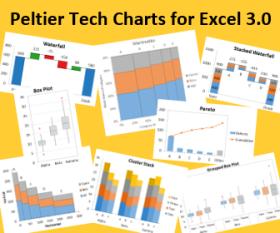 Excel 2007 faithfully follows most of this discussion, but not all, as the charting capabilities in Excel 2003 are more advanced and more consistent.) 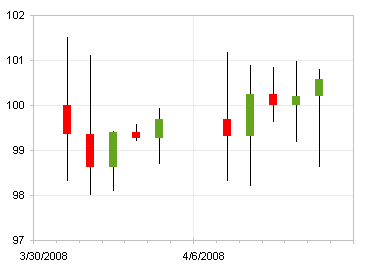 Below is a line chart of the same stock data as in the candlestick chart above. The data is shown below, or you can click here for a CSV file. I’ve added columns F:J for use later in this discussion. 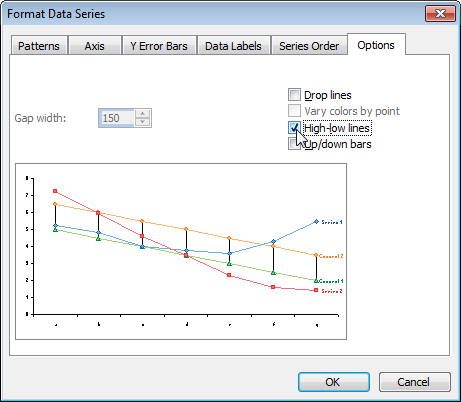 You can select any of the line chart series and open the Format Series dialog. On the Options tab, select the High-Low Lines and Up-Down Bars options. The High-Low Lines option draws a line from the highest to the lowest of all line chart series plotted in the axis group (primary or secondary) of the selected series, no matter what order the series are in, as long as there are two or more line chart series. 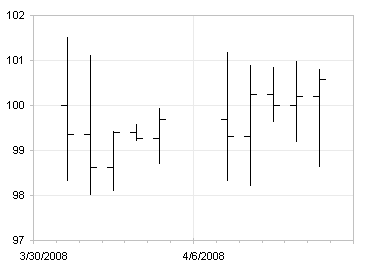 The Up-Down Bars option draws a bar from the first line series to the last line series in the axis group (primary or secondary) of the selected series. The bars representing an increase from first to last are in a different formatting group (Up Bars) than those representing a decrease (Down Bars). Therefore, although it doesn’t matter how many line chart series you have (as long as it is a minimum of two), the order of series is very important: Open should always be first and Close should always be last. By default, Up Bars are filled white and Down Bars are filled black. 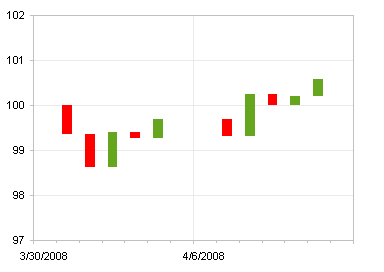 The chart below is a line chart with High-Low Lines and up-Down Bars. To produce the candlestick chart at the top of this post, the line series themselves are formatted to show no markers and no lines. You can right click on a set of bars, choose the Format item in the pop-up menu, and format the bars. I sometimes forget whether the up or down bars are black and white in the default color scheme, so I color gains green and losses red. You can pick any color scheme you want, but all up bars get one scheme and all down bars get another. You cannot selectively color any individual bars with distinctive colors. 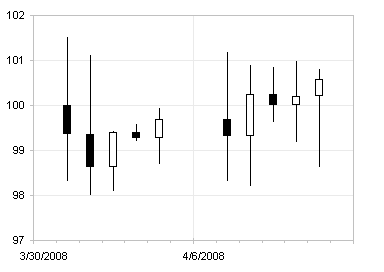 I’ll describe the alternate approach you need to follow to enable formatting individual up-down bars, but first I’ll show a stock chart appearance which is very common in financial sources. 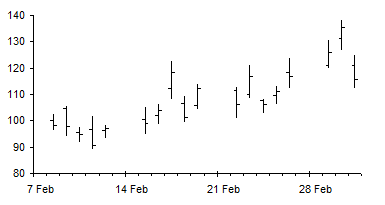 Instead of the up-down bars, this chart shows a left tick for an opening price and a right tick for a closing price. Excel offers a variation that has a right tick for closing prices, but no left tick option. I rely on smoke, mirrors, and error bars to get this effect, as described in Stock Charts and Other Line Chart Tricks. Then format the Float series to be invisible (no border and no fill) and the Up and Down series to be the colors you want (I used the same green and red color scheme I’d used for the Up-Down Bars in the earlier chart). Although individual bars can be formatted separately, I kept separate series of Up and Down Bars, so that I could format each series in one step, rather than formatting several individual bars the same way. As stated above, you can get High-Low lines with a pair of line chart series. The steps are: add series for High and Low, change the chart type of these series to line chart, add High-Low Lines, and hide markers and connecting lines. I didn’t go through the protocol in detail, because the results are not what we want: The High-Low Lines lie in front of the Up-Down Bars. This is simply the way Excel draws these chart elements, and we cannot change that. 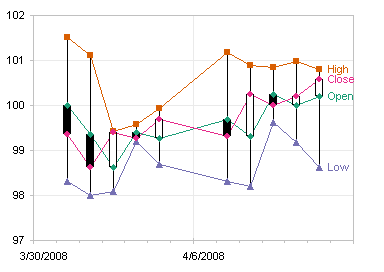 Select the Float series (use the chart element selector dropdown on the Chart toolbar, since the series is invisible), press Ctrl+1 (numeral one) to bring up the Format Series dialog, and on the Y Error Bars tab, click in the Custom (-) box, and select the range containing the Min values (J3:J12 in my table). Select the High series, press Ctrl+1, and on the Y Error Bars tab, click in the Custom (+) box, and select the range containing the Max values (I3:I12 in my table). Double click on one set of error bars, and choose the style that has no end cap. Repeat for the other set of error bars. Now you can individually format any of the pseudo Up-Down Bars. Click on the bar to select the series of bars, then click on it again to select it by itself, then press Ctrl+1 to open the Format Point dialog, and select any colors you like. Posted: Monday, April 14th, 2008 under Chart Types. Tags: candlestick, error bars, Line Chart, OHLC, stock chart.